This Gary Sutherland's first solo card. It's also the first of his cards that I got (in 1968), since his rookie card was in the 1967 7th series (none of which I had until the mid 1980s). 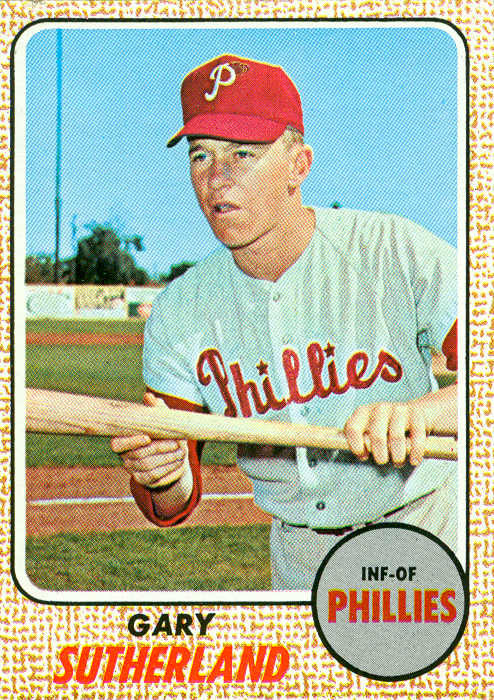 Sutherland was one of my favorite players on the 1967 Philadelphia Phillies (my introduction to MLB). Why? I don't really remember - maybe because he was an upstart rookie, getting a lot of playing time as a platoon player among so many veterans. 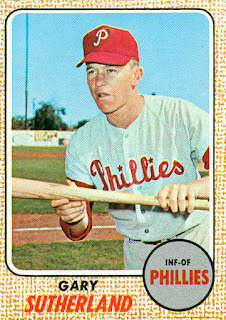 Sutherland was signed by the Phillies in 1964, the year after they signed his brother Darrell (and his other brother Darryl). 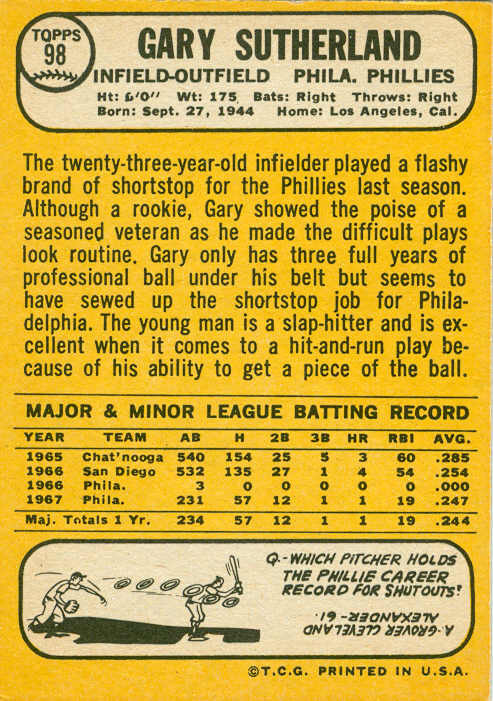 Gary played just 2 seasons in the minors (as the fulltime 2nd baseman at double-A Chattanooga in 1965, and the fulltime shortstop at triple-A San Diego in 1966) before making the Phillies at the start of the 1967 season. Although this card lists his position as "INF-OF", during his rookie season he only played shortstop and left field. For the first half of the season he platooned in left field with Johnny Briggs, and also played shortstop when Bobby Wine was not in the lineup. 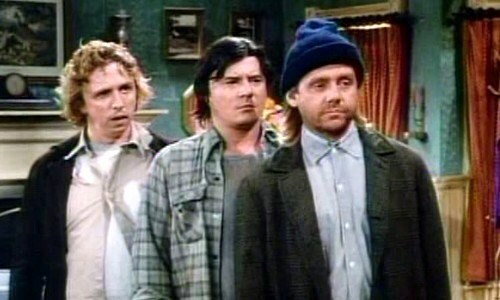 As the season wore on, the Phillies stopped platooning in left field, decreasing Sudsy's playing time. During the 1968 season, Sutherland was relegated to utility infielder status (even with starting shortstop Bobby Wine going down for the season on May 12th with a back injury). The team recalled journeyman infielder Roberto Pena from the minors to handle the shortstop post. Sutherland only made 6 starts there to Pena's 128 starts. After the '68 season, the Phillies lost Sutherland, Wine, and Pena to the expansion draft, with Sutherland and Wine going to the Montreal Expos. Gary was the Expos' starting 2nd baseman in their inaugural season, but shared the position with Marv Staehle in 1970. In 1971 he was the backup 2B/SS (behind starters Ron Hunt and Bobby Wine). Sutherland spent most of 1972 and 1973 in the minors. Along the way, he was traded to the Astros in June 1972. It would take a December 1973 trade to the Tigers to get him back to the major leagues. Gary made a comeback as the Tigers' regular 2nd baseman from the start of the 1974 season until his early June 1976 trade to the Brewers. In Milwaukee, Suds shared the 2nd base job with Tim Johnson and Jack Heidemann. 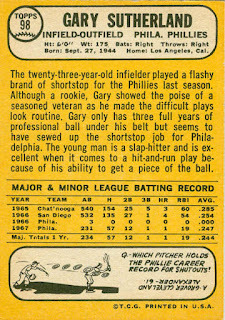 Gary was released prior to the 1977 season, and soon signed with the Padres. After the season he was released again. In January 1978 he was signed by the Cardinals, but was released in late May, ending his career.